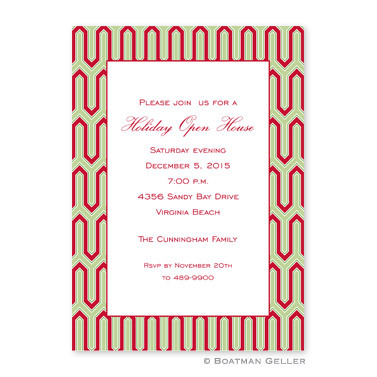 Description: This colorful, elegant invitation is a perfect holiday party invite. You choose your wording and ink color and your guests will be delighted to come party! Price includes up to 8 lines of copy. Invitation is 5" x 7". And for an especially nice touch to your invitation, add an envelope lining in a matching or coordinating design/color (Liner Options: jungle, raspberry, navy, cornflower, cherry, midnight, kelly, mocha, lime, chocolate, tangerine, pine, slate, cranberry, gray, turquoise, plaid red, black watch plaid, swiss dot red, swiss dot pine, swiss dot teal, damask white & black, damask chocolate, damask cranberry).